A thick silicone gasket that makes mason jars completely airtight. Fits wide mouth mason jars and other jars with the same size lid requirements. May be used with Fermenta Lock Caps or with storage caps. Not recommended for use with canning. Special “grippy” design keeps the gasket snugly in the lid until you take it out! Won’t fall off when you remove the lid! Silicone provides a slightly softer surface than latex, which conforms to the rougher edge of a mason jar to form a completely airtight seal. 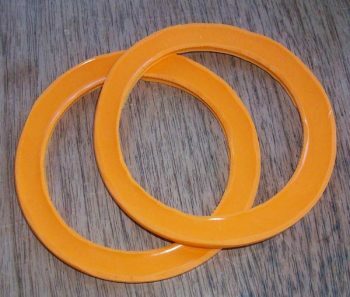 This gasket is thick enough to seal any mason jar edge that is undamaged by chips or nicks. Fermenta Lock works well without the gasket when lids are properly tightened down! It is not required for proper use of the lids. We are offering this for people who want the extra assurance of a gasket for those who feel that they may have better results with it, or for people who want a gasket for storage lids that will keep liquids in the jar if it tips over. Manufactured by hand, from food grade silicone. Silicone is more costly to produce than latex, and is more expensive to use, but is less likely to crack, break, or become sticky with repeated use. This item may be manufactured on demand, and typically ships within 3-4 days of receipt of verified payment.